A 3D camcorder for under $200 US, are you kidding? 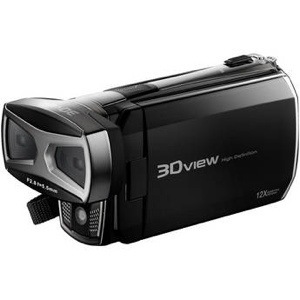 Yes this is a sub $200 3D camcorder. I first saw this when I was looking for a pro model camcorder to do stock videos with. I dismissed it as I really needed a camera with a high quality lens and sound recording ability. Later I decided to revisit the possibility of 3D video just for fun. The price was right so knowing it was just a fun toy I took a chance on it. The camera is light weight and I’m sure for most this will be a good thing. I like my cameras to be a bit heavier as the weight helps to steady the camera. The controls are simple as is the menu. It stores video on SD media, I used a class 10 16gig scandisk for my testing. It has an almost instant on. Just flip the lens then open the view screen. The view screen is in 3D, no need for 3D glasses. The only issue is when the lens is open you can’t tilt the screen too much. The camera has really good image quality. It may be a bit awkward at first because of the stereo lens but that isn’t too bad. Video is sharp and crisp with very nice color and contrast. I was shocked to see what this camera could do. The only real issue I had was a choppy zoom. I really wish the zoom was smooth but for the price and the image quality I can deal with the slightly jerky zoom. The microphone is stereo and located in the front part of the monitor door. This does well as long as the sound that is right in front of the user. If there was one thing that would really make this camera sell better that would be the addition of an external microphone, but they did not add the plug. Since I did buy this camera to just play around, for me that missing feature was not a big deal. Conclusion – If you want a fun little camera to create 3D video with this is the camera for you. It has a low price and great image quality. I really enjoy using this camera. If you need features like an external microphone and smooth zooming then you may want to look at some other cameras. Again I would recommend this to users who want a fun camera or those who want to dabble in 3D. It would be hard to beat the quality at the price of this camera. Thanks for the review, I was using my LG Thrill phone to do 3D, but it only captures video @30fps. Figured for the great price on this camcorder and 60fps and HD720 I would try it out, and your review helped!